Have your last summer hurrah with your kids by visiting these very interesting farms before school starts again! Summer is all about freedom, fun, and the great outdoors – and what better way to capture the spirit of all these three than by making a trip to a real, honest-to-goodness, all-natural, fresh-air farm? Feel the soil on your feet and the wind in your face. Get up close and personal with the animals and plants. Learn a thing or two about the most modern, efficient, and Earth-friendly agricultural techniques. And after your tour, indulge in a delicious meal made with fresh farm-grown ingredients, harvested and prepared right from the same farm. 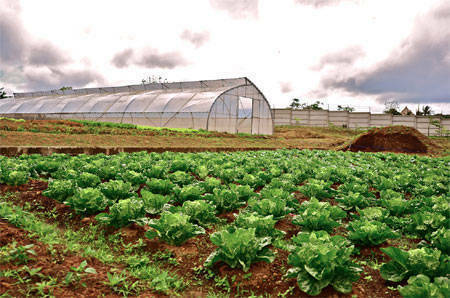 Not far from Metro Manila, and very close to Tagaytay, you’ll find Gourmet Farms, one of the first organic vegetable farms ever established in the country. Although it was started from a mere 2-hectare piece of land, Gourmet Farm now covers a sprawling 11.5-hectare area, so you’ll definitely not run out of things to see. The farm is laden with different kinds of lettuce, local veggies such as okra and sayote, and culinary herbs such as rosemary, thyme, tarragon, coriander, parsley, and dill. All of these are cultivated without the use of commercial fertilizers or pesticides. Instead, the farm encourages the proliferation of carnivorous insects such as praying mantises and lady bugs, which eat the insects that are harmful to the plants. For fertilizer, they get chicken manure from a nearby poultry farm. If you want to learn more about their organic farming methods, the farm staff will gladly fill you in on the details. For ₱100, you can get a tour all around the organic farm and greenhouse, see how the vegetables are grown and harvested, and get a refreshing glass of herbal iced tea. You and your kids can also get a mini-seminar on how to make rich compost using edible wastes, as well as a lecture on recycling management, or how to make new and useful things out of used materials. For an additional ₱50 per module, you can also get lessons on herb planting, harvesting, drying, and cooking (you will bring home the herb you plant); lettuce harvesting (you can take some of the lettuce home); and salad making (they’ll show you how to make the salad and the dressing, and you get to eat it). After your trip, you can visit the Gourmet Café right on the farm, to feast on excellent organic teas, brewed coffee, salads, sandwiches, pizza, pasta, and refreshing fruit and herb blends, all made from the farm’s own produce. To learn more about Gourmet Farm at Km. 52, Aguinaldo Highway, Buho, Silang, Cavite, you can call their Manila office at (02) 843-8311, or their Cavite office at (046) 414-1049, or visit their website, www.gourmet.com.ph.